My front porch faces the west and gets a lot of sun and heat. It is also level to the ground with only one small step down. 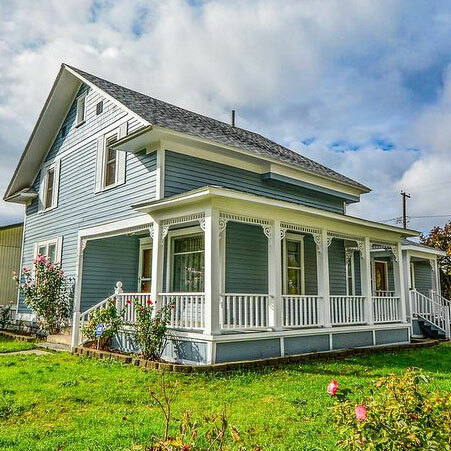 It has the standard white railings and white wooden columns, which at this time we do not want to change, but I do not know how to decorate my porch to get the warm country and welcoming feeling. It is about 20' x 8' in size with a roof that has vinyl siding where you cannot hang anything from it. We live in PA and this is our first nice home together and we want it to look and feel good. Can you provide any suggestions on how to decorate it? I would appreciate any advice. Our reply: Toni, so nice of you to visit our website and submit this great question. A front porch that faces west can be toasty in the summer. My first suggestion is to create some shade on your porch. You will enjoy it so much more if it's shady with a little breeze blowing. 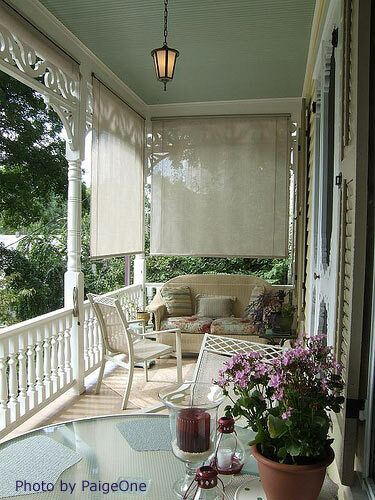 Consider outdoor curtains, porch blinds or roll-up porch shades. An outdoor ceiling fan would also be such a welcome addition to your front porch. If that is not possible, due to your porch ceiling, you could easily use an outdoor floor fan - maybe one that's on a pedestal. You can easily create your own outdoor curtains or purchase them. We have seen some attractive curtains made from painters drop cloths that you purchase at Home Depot. They come already hemmed. 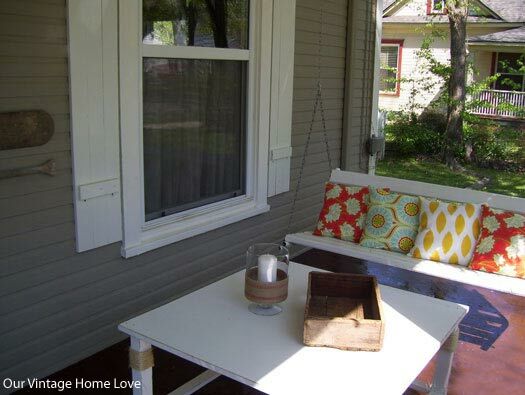 You would want to have enough curtains so that you can pull them across your porch when the sun is hitting your porch. Then in the evening, you can pull them back. 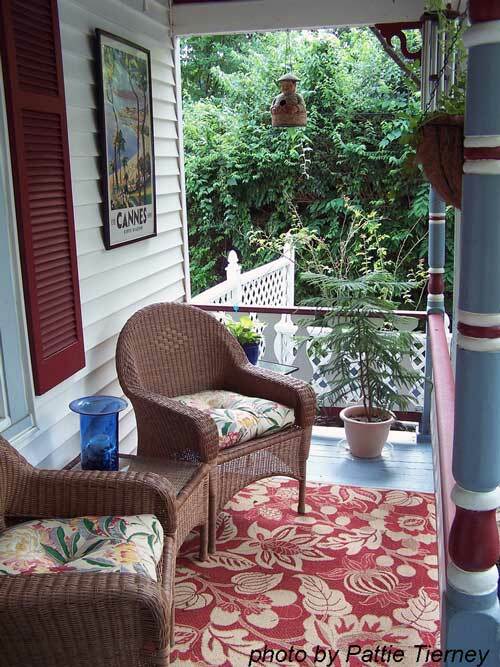 To give your porch some pleasing color and a country feel, how about a nice outdoor area rug? You can find them in so many gorgeous colors, patterns, sizes and shapes. Besides finding them online, you can also find them at home improvement stores. We can't state for a fact, but if the rug states it's for outdoors, then perhaps it won't fade from the sun. We have seen some fun ways that homeowners have jazzed up their porch floors with paint. 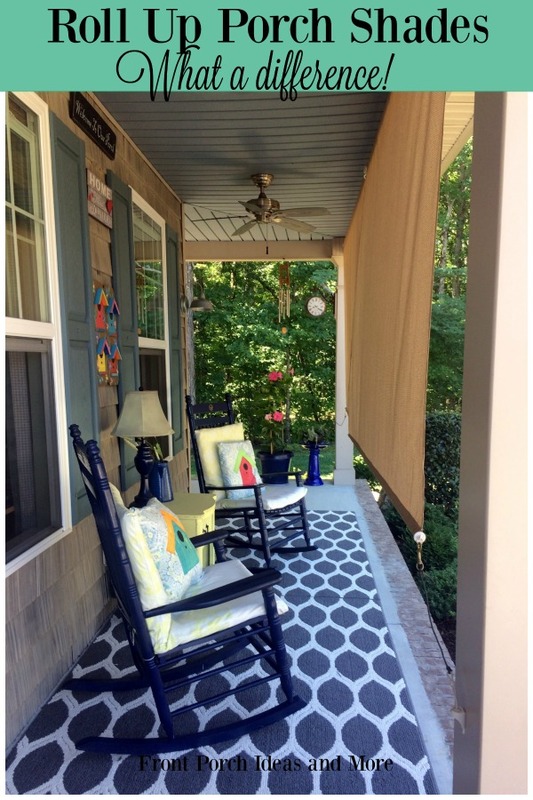 Look at John and Sherry's porch makeover - their floor is striped. Get some very comfortable porch furniture. You need not spend tons on it - sometimes you can find nice pieces at thrift stores or flea markets and refurbish them. A self-standing porch swing or porch glider would be fun. Make or buy some colorful cushions and add pillows like Diana did in the picture below. Add a few chairs, a table or two and then some potted plants. 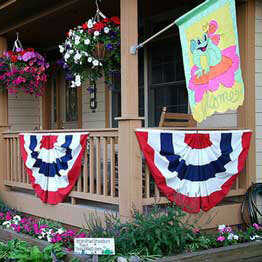 You can hang planters over your rails or line your porch steps with heat-tolerant plants. Keep them watered! Finally, add some outdoor lighting to your porch. Look for outdoor floor lamps or table top models (since you cannot hang anything from your ceiling). 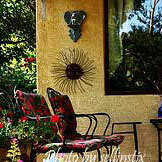 And don't be shy about hanging outdoor art on your walls. That's another way to give your porch a personal touch. Decorating a porch is fun, Toni! We hope you enjoy trying some of these ideas to create a porch you will both love. We'd love to see how it turns out. Thank you, Toni. Anonymous, you must be exasperated trying to decorate your porch with all the wind. Let's tackle the curtains first. This may sound complicated or "over the top" but it may also generate other comments and ideas as well. First, I would install two eye screws (small with about a 1 inch eye) on the columns. Position them so that one is at 1/3 from the top; the other just over 1/2 way down the column. Next, purchase "D" rings (at your local home supply store) to attach to the eye screws. Purchase a smaller diameter nylon braided rope; it looks really nice. Cut a piece about 8 - 10 inches long. Make a loop on one end (double back the rope) and secure it with a rope clamp - also available at your home supply store. Repeat this process on the other end as well. When the wind blows place the the rope around the curtain, secure the ends of the rope to the d-ring and snap the d-ring onto the eye screw. Sounds complicated but it really is easy to do, takes about 20 minutes once you have the materials and your curtains won't blow away. Now the outdoor fan. It's not the fan but rather how it is mounted. Without being able to see your porch roof I can't really give you a specific suggestion; however, you need to bolt the mounting frame to the ceiling joists and then secure the fan to the mount. You may also have to modify the fan's mount so you can actually bolt it to the ceiling mount. If you've already done that and it still gets blown away you may have to forgo the ceiling fan and opt for a floor model that you can secure during a storm. I recently purchased outdoor curtains and rods for my covered deck. The deck faces west and the curtains help block the evening sun. I'm having a problem when it storms though. The curtains blow wildly in the strong wind and I'm worried that something is going to get damaged. I have tie backs but the wind is so strong sometimes that they come loose. I have tried a bungee cord wrapped around the deck column at the tie back level, but some how the curtain came loose. The deck is about 9 to 10 feet tall and our house in on a hill; I think this factors in to the wind problem. We used to have a ceiling fan out there and a storm blew it down. We replaced it with a sturdier outdoor ceiling fan and a storm tore it out of the ceiling as well. Needless to say the wind is really interfering with my outdoor decor. Dave and I have lived in our home now for several years now and it wasn't till this summer that we finally got roller shades for our porch. Oh my heavens! What a wonderful difference they make. Not only does our porch and home stay cooler, but our outdoor furniture and decorations are protected from that hot afternoon sun. Read about our shades and how we put them up.